September 11, 2016 By Elizabeth Lindemann 8 Comments / This post may contain affiliate links. When was the last time you had something for dinner and immediately ate the leftovers for breakfast the next day because you couldn’t get it out of your head? It doesn’t happen often, but as I am writing this at 9:30 a.m. whilst enjoying a bowl of this Green Machine Minestrone Soup after having two three helpings last night, I’m realizing that this is potentially my new FAVORITE soup. If you know me, you know I don’t like to play favorites with my food. I love all my food equally. Usually. But this soup changes everything I thought I knew. This is anything but your basic minestrone soup. It has all the main parts- veggies, beans, and pasta- but it’s so much more than that. First of all, it’s PACKED with good for you green veggies, including broccoli, zucchini, spinach, and cabbage. Second of all, fresh basil and thyme are stirred in right at the end, imbibing the flavor of the herbs into the soup and keeping the flavor super fresh. It makes it almost like pesto in soup form. Lastly, the soup is finished off with some freshly grated Parmesan cheese, fresh ground black pepper, and a drizzle of high quality extra virgin olive oil. Goodness gracious. Simply amazing. This is one of those recipes that came about because I had a bunch of random leftover ingredients needing to be used. Some spinach about to wilt, a zucchini on its last leg, a random quarter of a head of cabbage leftover after making coleslaw, and a can of forgotten cannellini beans in my pantry. 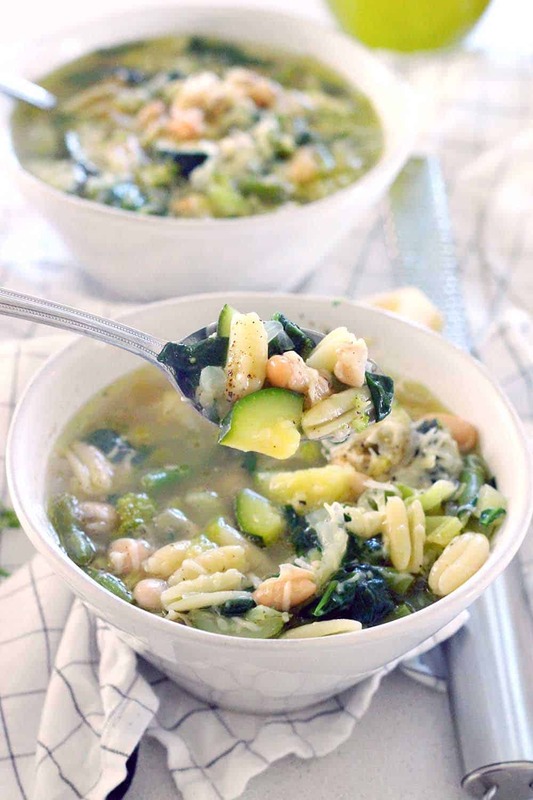 The beauty of this soup is that ingredient portions don’t matter very much (and to be honest, I estimated the amounts in the recipe below), and you can add or omit ingredients as necessary (add cauliflower, leave out the broccoli, add carrots, leave out the zucchini, use another kind of bean, etc.). Make sure you use fresh basil and stir it in right at the end. It’s SO flavorful. When using fresh herbs, you should almost always add them at the end of cooking rather than in the beginning, as their flavors will be stronger. Top it with good quality extra virgin olive oil. Finding a “good quality” olive oil can be somewhat elusive if you don’t know what you’re looking for. Try and find one that’s cold-pressed and/or unfiltered. It will have a more robust flavor. For affordable options, I recommend California Olive Ranch Extra Virgin Olive Oil, available at most grocery stores and on Amazon. Trader Joe’s Tunisian Organic is great (and comes in a cool tin!) as well as their California Estate. Unless you’re vegan or vegetarian, make sure to use chicken broth instead of vegetable. And use freshly grated Parmesan cheese. Keep a block of Parmesan ready to go in your fridge at all times and ditch the aisle kind in the green canister! 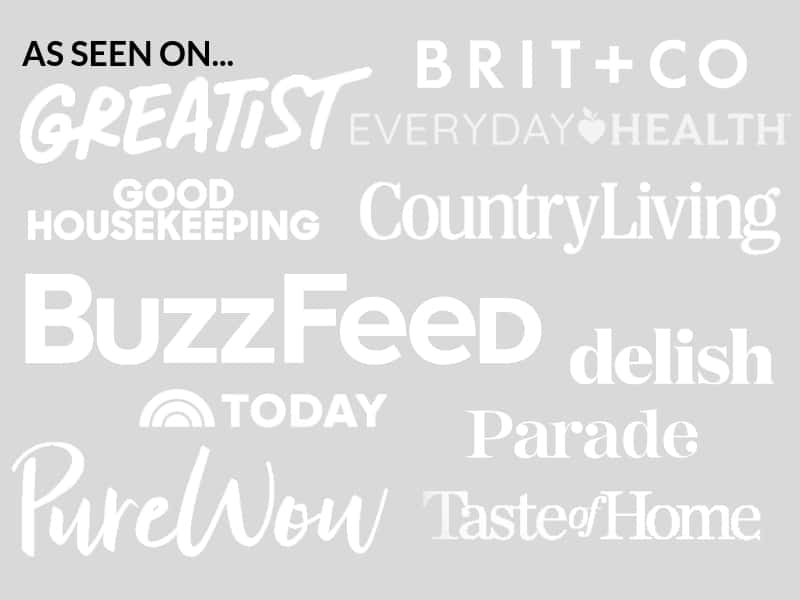 It’s worth the splurge. 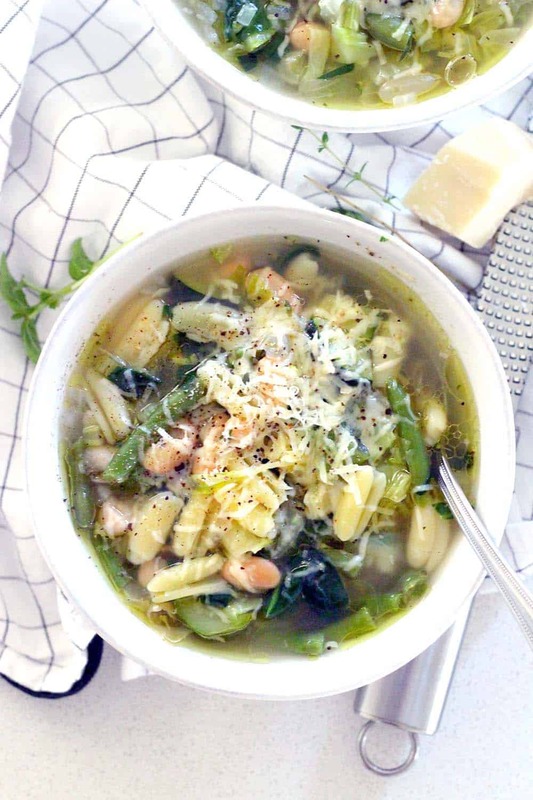 Like most recipes on Bowl of Delicious, this soup comes together quickly (in about 30 minutes) and is extremely easy to make. Plus, it’s a one-pot meal and is freezable! Check out some other quick and easy or soup recipes. 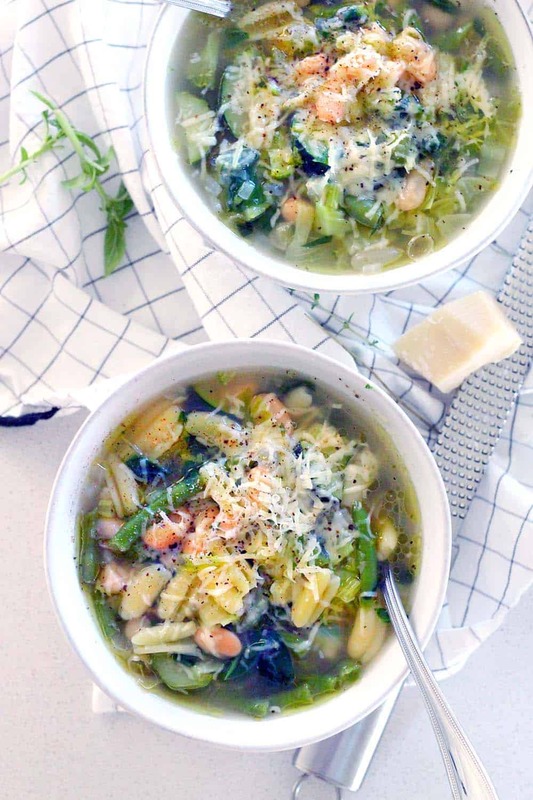 This minestrone soup is PACKED with healthy green veggies, fresh herbs, and topped with a drizzle of olive oil, Parmesan, and pepper. It comes together in 30 minutes and is freezable. extra olive oil Parmesan cheese, and fresh ground black pepper for serving. In a large pot, heat the oil and saute the onions and celery over medium high heat until softened and starting to brown (about 3 minutes). Add the garlic; stir until fragrant (about 1 minute). Add zucchini, cabbage, broccoli, and green beans. Season with salt and pepper, and stir to coat. Add the beans and pasta and turn heat to low. Simmer until pasta is cooked; about 10 minutes. Turn heat off. Stir in spinach, basil, and thyme until wilted and soft. Serve with a drizzle of good quality extra virgin olive oil, Parmesan cheese, and freshly ground black pepper. For a vegetarian version, be sure to use vegetable broth instead of chicken. For a vegan version, use vegetable broth and omit the cheese on top. For a gluten free version, use gluten free pasta. For a grain free version, use grain free pasta such as chickpea flour pasta. Freeze the leftovers in an airtight container, or make a double batch and freeze one for later. Just made this and all I can say is wow!!! Bravo Liz!!! Will be making this a regular staple in our home! This is a great recipe to use up your CSA basket! Definitely- especially because you can throw whatever the heck you want in it! Yay! 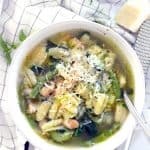 At last, a minestrone that does not have tomatoes! I cook for the week every weekend, and alas, it’s Monday! But this is a huge blip on my radar screen and will be prepped as soon as I eat up what’s in the ‘fridge now. Thanks! Can this be made in the slow cooker? Yup! I haven’t tried it but here’s what I’d do. Just add all the ingredients besides the beans, pasta, spinach, and herbs. Cook on low for 6-8 hours or high for about 3 hours and add beans and pasta; cook for another 30 minutes. Stir in the spinach and herbs right before serving for only about 5 minutes until wilted.